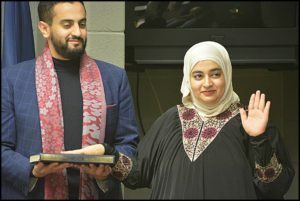 The first Yemeni-American woman, Jihan Aiyash, to serve on the Hamtramck School Board was sworn into office recently. Her brother, Abraham Aiyash, holds a Koran as Jihan takes the oath of office. It’s a new year and there are some changes in city government and the Hamtramck Public School Board. For the city council, City Manager Kathy Angerer has canceled work sessions that have taken place an hour before the regular council meetings for the last three years. The work sessions were created by former City Manager Katrina Powell. Prior to that, work sessions were held here and there, usually just for special issues. Powell started up the work sessions in an effort to train councilmembers on how government works and to allow time for them to vent. That was at the time when the city was under the supervision of the state Treasury Department. The city was in the process of coming out of being under the control of a state-appointed emergency financial manager. Initially, there were some councilmembers who protested the work sessions, saying the public was being shut out of their discussions despite the fact that work sessions were always open to the public. The meetings were held in a much smaller room than the regular council chambers, but there was rarely any issue of people not being able to get in. Flash forward to now, and Angerer told The Review the reason she canceled the work meetings was there is no longer a need. “We will discuss matters in open session and on camera,” she added. But there was some opposition. “Work sessions are when we can ask questions and get clarity on things. Taking away the work session is a step backward and is a disservice to community,” said Councilmember Ian Perrotta. Councilmember Anam Miah – who has been steadfastly opposed to the work sessions – welcomed the change. Council meetings are held in city hall on the second floor on the second and fourth Tuesdays of each month, and they start at 7 p.m.
Over at the school board, new member Jihan Aiyash was sworn in at the January board meeting. She beat incumbent Ataur Khan in last November’s General Election in a write-in campaign. Khan initially decided not to seek re-election, which left an open seat on the board. That left Board President Maggie Srodek the only candidate running for re-election – at least initially. Khan had second thoughts about seeking re-election but missed the deadline to register to be on the ballot. He ran as a write-in candidate. So did Aiyash, who had never run for public office. She ended up soundly beating Khan in the election by 542 to 290 votes. She is the first Yemeni-American woman to hold a position on the school board. Aiyash is no stranger to the field of education. She is a graduate research assistant at Wayne State University. Her brother, Abraham Aiyash, ran for state senator in the November election but lost.